This sounds cool. Bar Roubaix at 14th and Irving is hosting a pop-up with New Orleans-inspired food, cocktails and other drinks. There's a soft opening tonight and it will run until Mardi Gras, which this year is March 5. Read on for the full details. Bar Roubaix, if you haven't been, is the cycling themed spot that replaced Acre 121. They have pretty awesome happy hour deals and good European food, when not hosting the pop-up. WASHINGTON, D.C. (January 23, 2019) — Bar Roubaix is throwing a month-long fete for fans of Cajun flavors, king cakes, second lines, and fleurs-de-lis, with Sim’s Creole Kitchen. Located at 1400 Irving Street, NW, in Columbia Heights, the pop-up kitchen opens this week and will feature classic creole cuisine from the family recipes of New Orleans Chef Sim Bates. Chef Sim’s cooking is meant to warm you up and stick to your ribs. Guests can expect Red Beans & Rice, traditional and vegetarian Jambalaya, Grilled Oysters, and of course Grandma Bates Gumbo, with small plate options throughout. 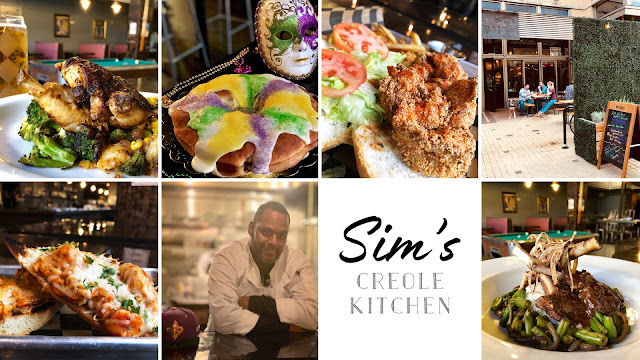 Sim’s Creole Kitchen pop-up runs through Mardi Gras with beignets, brass bands, second line dances, and New Orleans cocktails and beers all making appearances. The experience kicks off at the soft opening Wednesday night with 50% off the new menu and happy hour from open to close, and in traditional Crescent City fashion, happy hour won’t end till Fat Tuesday! For more information, please follow the team on social media (Facebook, Instagram, Twitter) @RoubaixDC. We attended an event here this past Sunday & had an awesome experience from beginning to end. They served great food at event venues here and the salad I had for dinner was delicious. The service also was impeccable.